While some medications are considered safe to take during pregnancy, the effects of other medications on your unborn baby are unknown. Therefore, it is very important to pay special attention to medications you take while you are pregnant, especially during the first trimester, a crucial time of development for your baby. If you were taking prescription medications before you became pregnant, please ask your health care provider about the safety of continuing these medications as soon as you find out that you are pregnant. Your health care provider will weigh the benefit to you and the risk to your baby when making his or her recommendation about a particular medication. With some medications, the risk of not taking them may be more serious than the potential risk associated with taking them. If you are prescribed any new medication, please inform your health care provider that you are pregnant. Be sure to discuss the risks and benefits of the newly prescribed medication with your health care provider before taking the medication. 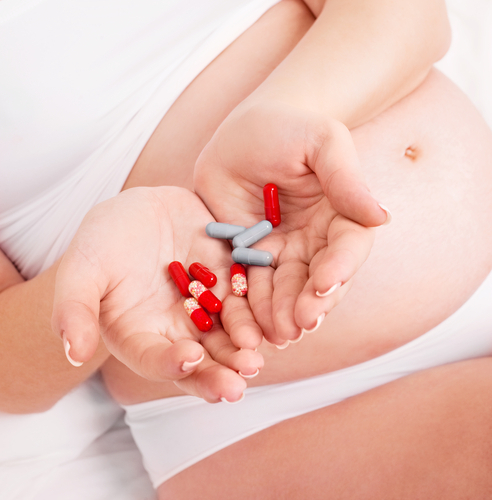 Prenatal vitamins, now available without a prescription, are safe to take during pregnancy. Ask your health care provider about the safety of taking other vitamins, herbal remedies and supplements during pregnancy. Most herbal preparations and supplements have not been proven to be safe during pregnancy. Generally, you should not take any over-the-counter medication unless it is necessary. The following medications and home remedies have no known harmful effects during pregnancy when taken according to the package directions. If you want to know about the safety of any other medications not listed here, please contact your health care provider. More recently, there was a Norwegian study which showed that children exposed to long-term uses of acetaminophen (main ingredient in Tylenol) for more than 28 days had "substantially adverse developmenal outcomes at 3 years of age." So until more information is available, long-term use of acetaminophen in pregnancy is not recommended. Tylenol (acetaminophen) or Tylenol Cold. *Important Safety Note: More recently however, there was a Norwegian study which showed that children exposed to long-term uses of acetaminophen for more than 28 days had "substantially adverse developmenal outcomes at 3 years of age." So until more information is available, long-term use of acetaminophen in pregnancy is not recommended. * Important Safety Note: Do not take "SA" (sustained action) forms of these drugs or the "Multi-Symptom" forms of these drugs. Tylenol (acetaminophen) * Important Safety Note: More recently however, there was a Norwegian study which showed that children exposed to long-term uses of acetaminophen for more than 28 days had "substantially adverse developmenal outcomes at 3 years of age." So until more information is available, long-term use of acetaminophen in pregnancy is not recommended. Monistat or Terazol. *Do not insert applicator too far. Many pregnant women believe "natural" products can be safely used to relieve nausea, backache, and other annoying symptoms of pregnancy, but many of these so-called natural products have not been tested for their safety and effectiveness in non-pregnant women, much less in pregnant women. Therefore, it is very important to check with your health care provider before taking any alternative therapies. He or she will not recommend a product or therapy until it is shown to be safe and effective.